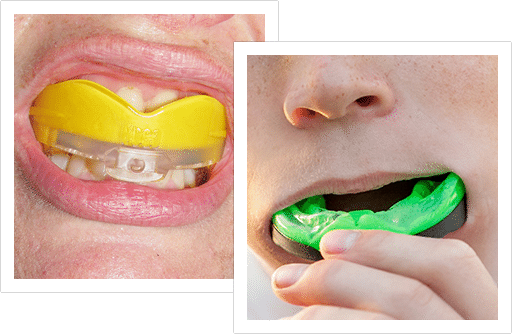 Laboratory processed professional grade ProForm mouthguards are prescribed for both professional and amateur athletes because they offer the highest level of protection, retention, comfort and fit, with minimal interference with speech or breathing during play. ProForm has the advantage over boil-and-bite types of mouthguards because of their superior fit and retention. In addition, ProForm mouthguards are thin, comfortable, custom fitted and will retain their shape long after other mouthguards have worn out. ProForm sports mouthguards reduce the incidence of tooth breakage and concussions, by distributing the stress of impact to the entire length of the tooth. This feature is provided by a double layer of laminated sheet vinyl with a lingual plate imbedded behind the incisors. Tensile strength, softness, compression percentage and uniform density are all important characteristics of mouthguard materials. ProForm maintains these characteristics using a heat/pressure laminating process. Tensile strength of the laminate is excellent due to the laminate’s two layers of materials making up the mouthguard. Density is maintained at the pressure laminating process so shrinkage of the mouthguard is uniformly controlled. Please call our office for your Customized mouth guard today!